(P1) Shopping centers in the Venezuelan capital, Caracas, say they will be halving their open times to four hours a day. (P2) The move will allow them to COMPLY WITH government energy RATIONING. (P4) A spokesman for the country’s RETAIL association said the drop in working hours would have an impact on jobs. (P5) The state energy corporation (Corpoelec) had wanted cuts twice a day, between 1pm and 3pm and then again between 7pm and 9pm. 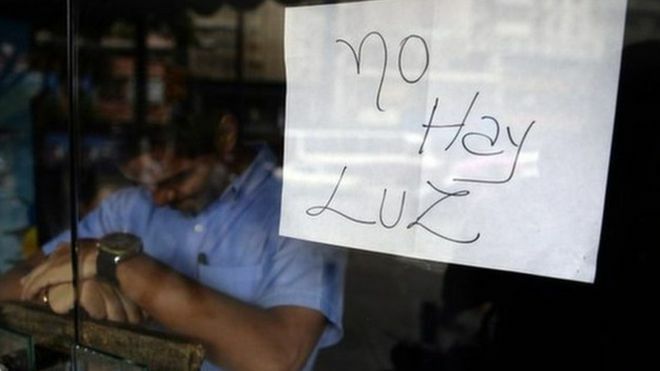 (P6) The retail association, The Chamber of Venezuelan Commercial Centres (Cavececo), said it had made an ALTERNATIVE proposal: that shops should open late at 12:00 and close at 19:00 saving five hours of energy use daily. (P7) But they had not received a response to this suggestion, the organisation said. (P8) “To turn the lights off at one in the afternoon and not to be able to work would have a huge impact on our business,” said Mleidys Galves who works in a pizzeria in the Lider Shopping Centre in Caracas. (P10) Cavececo said opening and closing twice in a day would be disastrous for banking operations, health centers, servicing companies, supermarkets, and restaurants. (P11) The government has also asked private residences to start saving energy and has been rationing domestic water supplies since January. The Venezuelan government has been criticized for its handling of recent economic and political CRISES. Does the government in your country handle crises well? If you owned a business and could only be open five hours each day, which five hours would you choose? Does your country get enough rain, or are there sometimes droughts? WILL THE NICARAGUA CANAL BE BUILT?